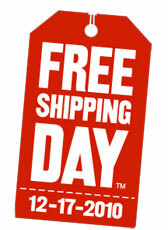 Shoppers spend $942 million on Free Shipping Day. Retailers' commitment to free shipping paid off on Friday, Dec. 17—this year's Free Shipping Day—when sales reached $942 million. The 61 percent year-over-year increase made Friday the third-busiest online shopping day this holiday season, behind Cyber Monday and Green Monday when sales totaled $1.28 billion and $954 million, respectively. Overall, consumers spent more than $5.5 billion during the week that ended with Free Shipping Day. That was a 14-percent increase compared to the same week last year, reports research firm comScore. "Free Shipping Day punctuated an exceptional week," says Gian Fulgoni, comScore's chairman. Experts had predicted that at least one more holiday shopping day would surpass the $1 billion mark, but now they say that's unlikely. Still, last week brought in plenty of cash for retailers, as four individual days surpassed the $900 million mark, according to comScore. Free shipping has been a big draw for buyers throughout the holiday season, comScore notes. In fact, nearly half of all sales in the past five weeks have included free shipping. "Since the week before Thanksgiving, we've seen the majority of online retail transactions use free shipping, which confirms the appeal of the offer for consumers," Fulgoni adds. "Free Shipping Day also appears to have driven a sustained late-season response, with free shipping transactions accelerating in importance in 2010, whereas they actually began to decline during the same period in 2009." Free Shipping Day will likely contribute to USPS' busiest shipping day, which is expected to be today, when an estimated 800 million letters and packages will be dropped off at post offices around the country. Jewelry, candy, clothing among top Valentine's Day Gifts.